THE MEDIEVAL GROUP WITHIN H.R.G.M. 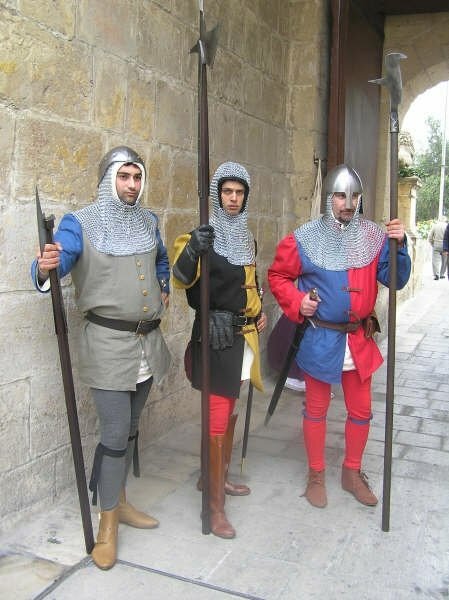 SEEKS TO REPRESENT A TROOP FROM THE ARAGONESE CROWN GARRISONS AT MALTA BETWEEN THE LATE 1300 AND MID 1400. During this period, Frederick’s IV Malta is a semi autonomous, Arabic speaking dependency of the Regno, where growing cotton was a mojor occupancy. It is a time when the family of Ciccio Gatto is appointed Castellan of Malta, but his family is pushed aside for the next two decades by the rise of a local strongman, Giacomo de Pellegrino a Messinese privateer who is related to the Counts of Malta through his marriage to ‘the royal kinswoman’ Margaret of Aragon. By 1356 he held the captaincy of the Maltese islands wielding power through his armed contingent. In 1372 the king himself, at the head of of a Genoese squadron of 10, led the siege of Pellegrino’s forces in the castrum –St. Angelo and Mdina. Apparently the royal involvement met with extensive local support which led to an exceptional show of force by an otherwise sovereign which was sealed by numerous grants of royal favours, posts and holdings to local inhabitants who, in one way or another, supported the Genoese-Sicilian intervention in the Maltese islands. Thirty-two concessions, issued in the six days between 8 and 14 November by Frederick IV in Malta, document the role played by various individuals in the reduction of the castle of Malta to royal obedience. But peace prevails for a short period. Around 1375, Frederick IV found once more that the royal patrimony was dispersing in private hands, undermining the ability to pay the salaries of the castellan and servientes defending the castrum maris. He appointed William of Aragon, Frederick’s illegitimate son and infante of Sicily, as Count of Malta. It was a return to feudal rule. Armed rebellions from the populance, supported by noble families follow. The crown read the situation as a direct challenge to it’s authority, for it proceeded to dispossess the ringleaders, reinforcING the Maltese Castrum. The rebellion seems to have spread around Malta and Gozo, causing regional repercussions. The fate of William, infante of Sicily and Count of Malta or of John of Aragon his captain on the island is unknown. Meanwhile in his will, Frederick stated that Maria, his daughter was to be crowned queen of Sicily. After his death though the Islands were drawn more closely into the sphere of influence of the ambitious count of Modica, Manfred Chiaramonte. No heed was taken of the king’s wishes, Maria being placed under tutelage of Artale Alagona, the magnate based at Catania. The Regno was divided into the wardships of four different magnates. The queen was kidnapped taken to Sardinia by Guglielmo Moncada, at the wish of King Peter IV of Aragon but he id not manage to conquer the island except symbolically. In 1377 Manfred Chiaramonte claimed his title of count of Malta. The feudal period led the islands to uncertainty and decline. 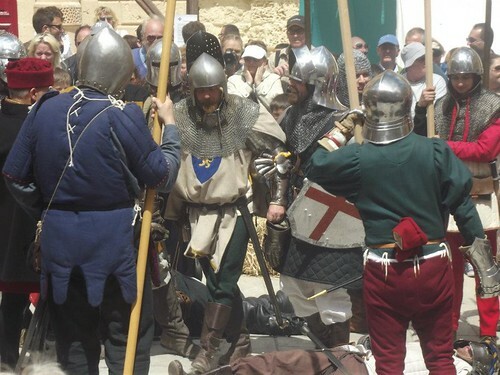 Heavy fighting in different places, including Gozo and Mdina, marked the transfer from feudal to crown rule. The stronghold of this insurrection became the Castrum maris and this developed in a lengthy affair lasting months, with the crown needing all the support it could master. This benefitted the islanders no better. This led a highly vulnerable defensive situation which together with the crown’s financial needs were certainly two factors behind the pawning of the islands by the new king. King Alfonso made a written agreement with his viceroy in Sicily, Antonio de Cardona for lordship over the Maltese islands. He needed the pawned 30,000 florins for his campaigns in the conquest of Naples. Cardona pledged to fly the royal flag over the Maltese islands, and be committed towards Aragonese foreign policy. The Maltese swore their loyalty towards Cardona against pledge that their rights and preveleges would be honoured. Four weeks later, Cardona officially transferred all his rights to Don Gonsalvo Monroy a Castillian galley captain and trusted servant of king Alfonso. In 1423 a Moorish force attacked the Maltese islands devastating the countryside and carried away a large number of inhabitants into captivity including apparently the Bishop. No direct effort was made to alleviate the serious food shortages faced by the population. This was apparently one factor forcing the Gozitan population to revolt against their lord who by 1425 had become admiral of Sicily and was numbering among the chief barons of the Regno. Monroy could not bring the island to heel, and turned to the king for help. The Maltese town councillors sent their representations to the crown. They pointed out they were doing all within their power to prevent the insurrection from spreading to Malta; pointing several grievances. The crown was alarmed but dragged it’s feet; Monroy was inflexible. The rebellion spread to the larger island in 1426. Monroy’s men, as well as his wife Lady Constance, are blockaded in the Castrum Maris. King Alfonso asked his viceroys in Sicily to appoint a governor for Malta. Upon his return to Sicily the Maltese and Gozitan populations were outlawed. By May 1427 forces were put together ready to set sail to subdue the revolt in the Maltese islands liberate Monroy’s men, including the Maltese who were at the Castrum maris and punish the perpetrators. Local representatives claimed their right to redeem the islands by paying Monroy his money. On 20 June 1428 King Alfonso V issued from Valencia an extraordinary royal charter in favour of the Maltese islands, which was to mark a political crown for the next one hundred years. The islands would always to form part of the royal demanio.